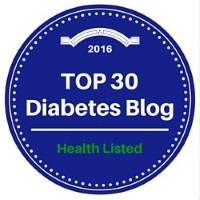 I have been a quiet blogger this November and done little to advertise or celebrate diabetes month. I was an active participant in the Big Blue Test but that was all behind the scenes. I have read the wonderful blogposts by other diabetes advocates and chosen not to feel guilty for my lack of participation. This morning I received an email from Chelsea at the American Diabetes Association asking me to participate in the second annual Healthy Lunch Day which is celebrated today. Easy enough because I eat lunch almost every day and it is usually a “healthy” meal! A salad is my most common lunch and today was no exception. The base was a Mann’s Power Blend containing Brussels sprouts, Napa cabbage, kohlrabi, broccoli, carrots, and kale. I topped it with raspberries, leftover cooked broccoli, a hard-boiled egg, and a yogurt-based dressing. I guessed the carb count to be 18 grams and bolused accordingly. I tend to spend two or three hours each afternoon at my kitchen table “desk” and like to avoid BG spikes with a lowish carb lunch. I go heavy on vegetables and berries to make up for my oatmeal breakfast that has nothing green or colorful. So here’s to #HealthyLunchDay and the ADA’s November theme of #ThisIsDiabetes. My lunch was healthy and I have diabetes, so it’s a perfect fit!